P.S. Not all inflatables are created the same. 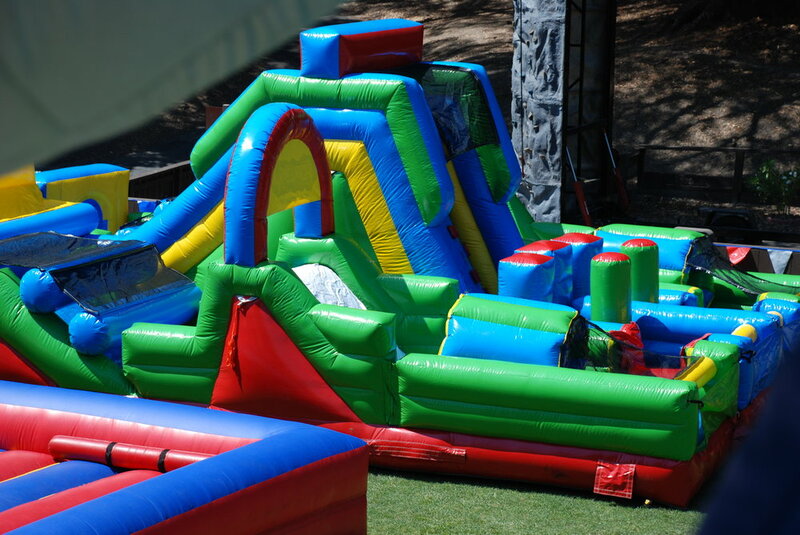 We have a variety of inflatables that far surpass your birthday party bounce house. 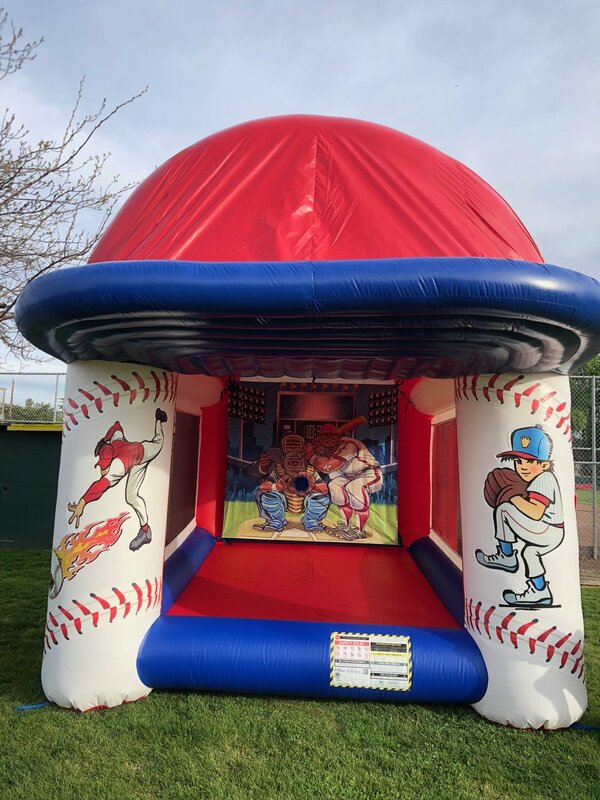 Check out our categeories below for more specific inflatables for your event, or scroll through to see everything alpahabetically. Huge 360° obstacle course is the ultimate race. Two players do their best to get to the end of the course before their opponent by crawling, squeezing, climbing, rolling, and sliding through the challenging obstacles. Separate but identical courses for each player adds an additional element of safety to the game. Players are safely strapped into a specially designed harness attached to a parachute inside the inflatable spacecraft. The attendant turns on a second blower and the player goes way up above the crowd for a birds eye view of everything. The attendant turns off the blower and the player floats gently down to earth. This is a very unique fun experience for kids. Maximum weight is 175 pounds. The action is fast paced in this competitive game. Each time you score a basket the ball comes out on your competitor’s side and each time they score a basket it comes out on your side. The object is to be the first one to get rid of the balls. The ball is suspended in air while the batter tries their best to hit it through one of the holes in the outfield. It could be a homerun or an out. The ball rolls back down to the front after each hit. This game is not just for the little ones. Kids up to 13 (even some adults) enjoy the challange. 12' x 14'. Kids can Monkey around in this cleverly themed bouncer. More fun than a barrel of monkeys! We provide the barrel (bouncer), and you provide the monkeys (kids)! Endless laughter and fun. The inflate is 20' round and 18' tall. This is a cross between a basket ball competition and tug of war. Each similar size player starts in the middle attached at the waist to their opponent with a bungee cord. On your Mark Get Set Go! Each player tries their best to make a basket on their side of the inflate, the problem is their opponent is trying to do the same thing as they are attached to each other with a bungee cord that will only stretch so far. Try to make a long shot and miss and you to experience the challenge of trying to pick up your ball while your opponent is pulling like crazy to get closer to their basket. Loose your balance while shooting and the other player will take advantage and bring you back to the middle so they have an easier shot. This is a challenging game that is fun to play and even more fun to watch. A giant bungee cord is attached to each player. Each player runs as far as they can until they are pulled back like a giant sling shot. Each player marks his or her distance with a velcro marker on the center wall. This 36' long inflatable will keep them coming back for more! Bring the classic carnival theme to life at any event with our Carousel Bounce! 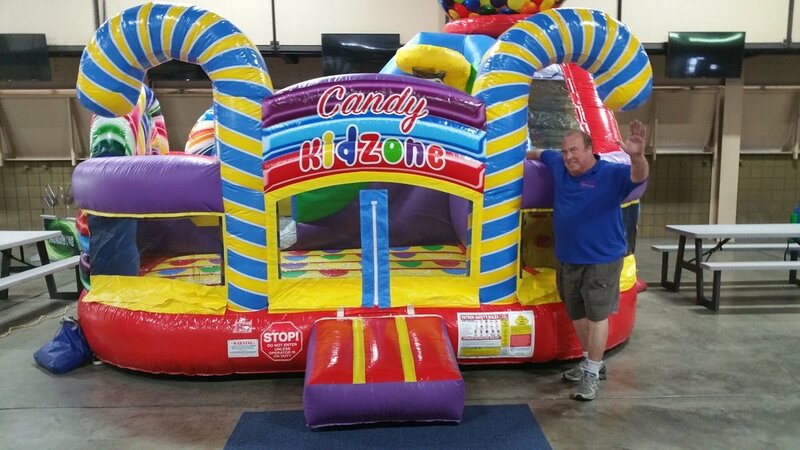 This 15’ X 18’ bouncer can hold five little ones for hours of fun! Players climb up the slide in the middle and then slide down either side of the game. The dual slides allow this game to handle a lot of players per hour. This unit is steeper, faster and has a slightly smaller footprint then our standard 22’ slide. We had it built with screening at the top so the players cannot jump from the top onto the slide. They must sit to slide. A great big fun slide that looks just like a Dump Truck! The unit is 35’ long by 20’ wide and 19’ tall this is a head turner! Combine it with our skid loader Bounce House and it is a great construction theme party. 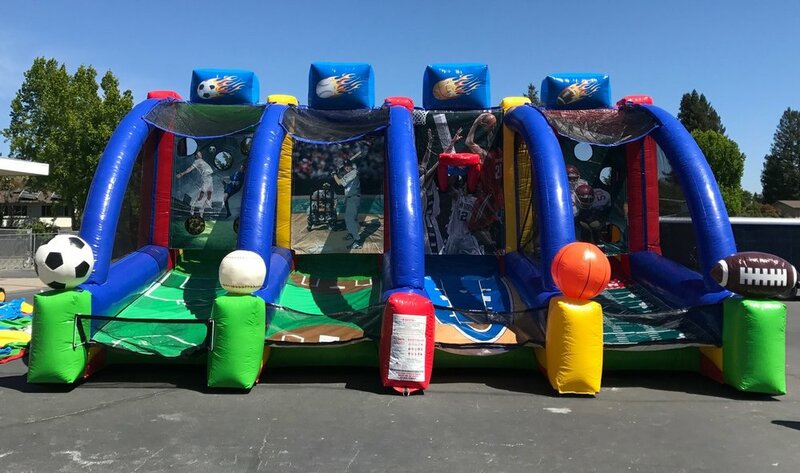 All the fun in one inflatable game, Basketball, Baseball, Football and Soccer! This game is a cross between King of the Hill and a Pillow fight. Four contestants try their best to knock the other player off the pedestal and onto the inflatable mattress below with giant padded jousting poles. This game is as fun to watch, as it is to play. The inflate is 22’ x 24’ and the minimum set-up area is 30’ x 30’ and requires one 20 amp circuit. At over 70 ft long this gigantic 3 piece unit delivers the fun. It has pop-ups inside, a jumping area two climbs and a slide. Fully netted on the sides add safety and good visibility of the players. You'll get DOUBLE the fun on this 60' long, 23' tall slide. This is one of the most impressive slides you've ever seen. It actually looks like a giant half-pipe complete with inflatable skater dudes on top. Players enter from one side, climb up and slide, then climb up the other side again. It looks great and is fast and fun. The inflate is 60' x 15' and requires a min. set up area of 70' x 25'. Or if space is a a problem, you may rent 1 section of the slide so it becomes a very fast fun single bay slide. Slide straight down or follow the curved slide into the pool. It is a fun ride either way. This inflatable that is 18’ tall and 36’ long. Access to water is needed. Available with a slip and slide that connects to the side so you have a spectacular and fun water attraction. Players on this life-size foosball "table" must hold tight to sliding sheaths covering flexible rods so, as with non-human foosball, they're restricted predominantly to lateral movement during play. Using a standard soccer ball, you and you 9 best kick-happy friends can try their foot at human foosball! A specially designed bow and arrow that is very safe. Player shoot floating balls into an inflatable backdrop. This game features a series of four giant inflatable balls which challengers must leap across to reach the other side. Climb up the ladder on one of the side platforms high above the biggest ball pit you’ve ever seen. Then try to cross the course by leaping from ball to ball like a frog or running across the giant balls to make it to the other side! But don’t worry if you fall off, this floor of the pit protected by our super-soft landing cushion featuring air bag technology. Beautiful and Fun! 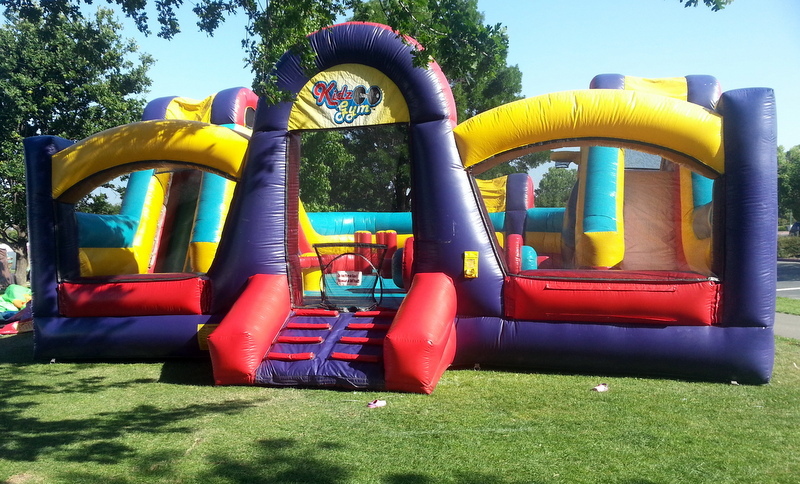 32’x 16’ x 17 tall allows plenty of room to party in this bounce slide combo. 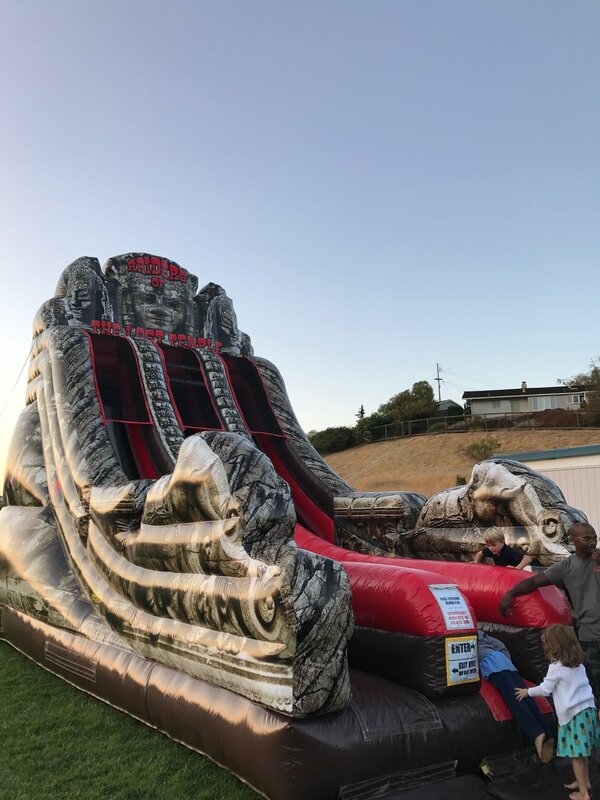 Standing at 22 feet with vibrant graphics and super fun and super fast double-laned slide, you’re sure to add some flash to any event! Toxic Meltdown is our 8 player action game, which challenges your stamina, agility and reactions. Jump, duck and be quick so you don’t get knocked off the podiums by the moving joust! The inflatable version of twister. If you thought the regular version of twister was funny, wait until you see people going for right hand blue when the surface is inflated. This is fun for kids and adults and a real crowd pleaser. This spectacular obstacle course incorporates a brand new “Figure 8″ design where you race your opponent in opposite directions instead of the conventional straight track. 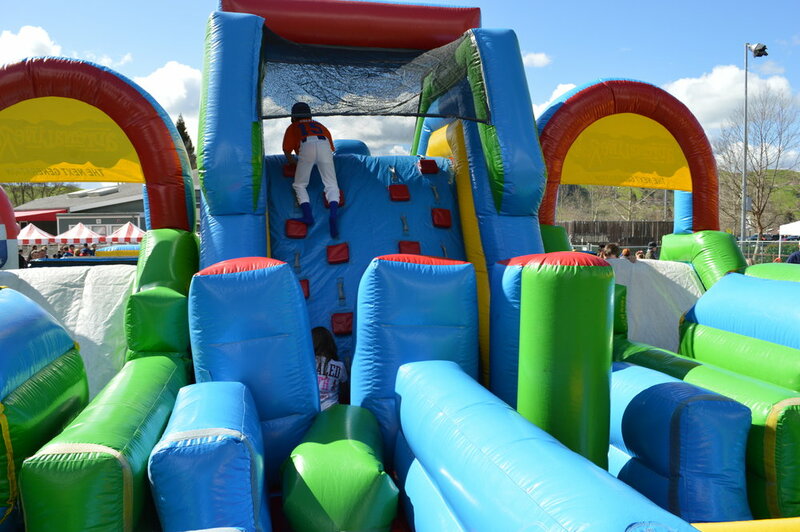 This enormous obstacle course stands over 24′ tall and has over 100′ of obstacles including, tire runs, squeeze plays, tackle dummies, tunnels, mini rock wall and a giant slide. Surf’s up! Get ready for summer at the beach and hop on our mechanical surfboard for the ride of you life. With out surf machine you can hang ten anywhere. An operator controls the system by adjusting the angle and motion of the surfboard adjusting difficulty levels to suit each individual. Don’t worry about wipeouts, participants fall into an ocean of inflatable fun. 18' single bay slide. Kids will have a blast sliding again and again on this attractive single bay slide. This is the perfect activity for hot summer days and pool parties. Players run and slide to the end. This is not like the slip and slide many remember as kids where you you jumped on a hard surface that hurt and then slid onto the grass. This is a soft landing with a stop at the end so no pain just plain fun. Requires access to a hose and electricity. Everyone that plays this game has a blast. Each player gets two balls to start. If you get the ball through one of the holes it goes to your opponents side and they now have 3 balls to get rid of. Get your last ball through the hole before your opponent kicks one back and you win. It is a challenge to get the ball through the hole and you are kicking as fast as you can to beat your opponent. It can also be played as a simple get it through the target and it comes back game. Combine the fun and competitive game of darts with the challenge of soccer and you get Soccer Dart! This giant dartboard attracts kids and adults to keep coming back to spend hours of fun! This 16' x 25' space themed slide and bounce duo is great for any party. Inside their is space men/spaceship pop-ups and a basketball hoop along with other various pop-ups to climb and crawl through. The colors and art on this inflatable are out of this world! Challenging and fun for all ages. State of the art radar and a large display allows each player to see how fast they can throw of kick. Available with baseball or soccer backdrops. Available in 2 sizes. This is an obstacle course like no other. In the back of this 38’ long inflatable are the eyes, nose and mouth of the spud. Each player must run through all of the obstacles and back again and place the face part on the spud then send their teammate for another. The first team to complete the face wins. This is one very competitive game! Perfect for Western themed events! This is a spectacular inflatable. 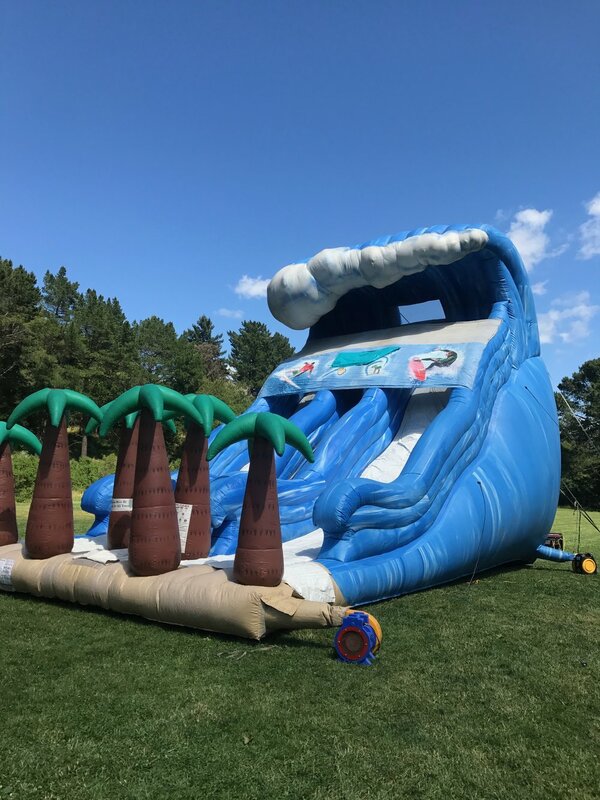 The giant wave is a dual bay slide and a work of art that is sure to be the center of attention at any event. 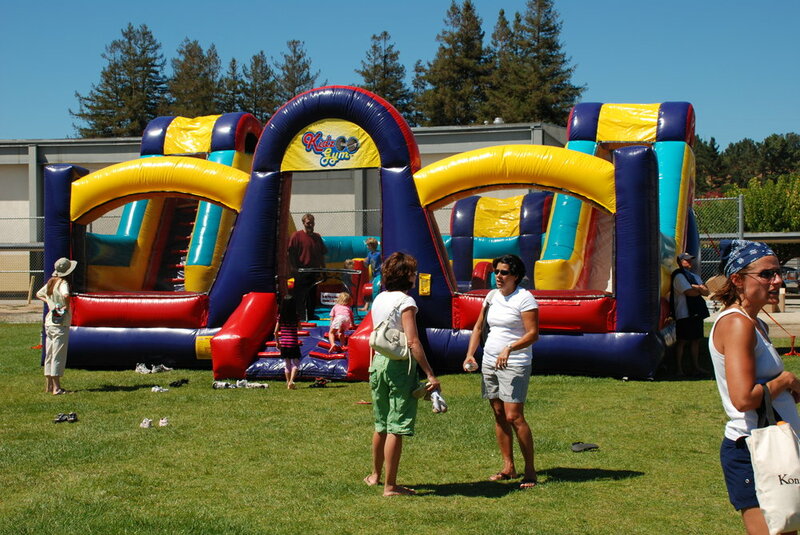 At 32' tall and a 24' slide area this is the perfect addition to a large event or picnic. 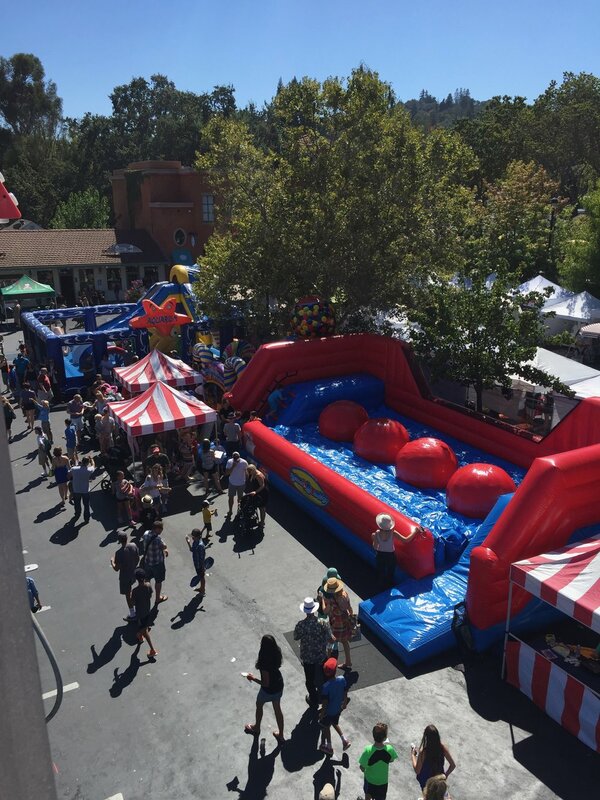 This a 52' Obstacle Course with stuff in the middle to make your way through and a slide at the end to make your way over. Everything is enclosed to make sure the fun stays in the game. A very fast fun unit with a Tropical look perfect for many theme parties. The player slips on a specially designed Velcro suit and launches themselves into the air off the inflatable cushion step to see how high they can go. They stick to the wall in the position they hit it. Hilarious and fun! It's a Wacky World, especially in this fun-filled adventure! Run, climb crawl, hopscotch, slide, jump, dodge, squeeze and twist yourself wacky. Wacky World incorporates both a hopscotch and twister style surface for kids to play. Excitement abounds! The inflate is 29' x 28' and is 12' tall. You’ll not only have fun playing in this unit but you’ll have a blast watching it too. 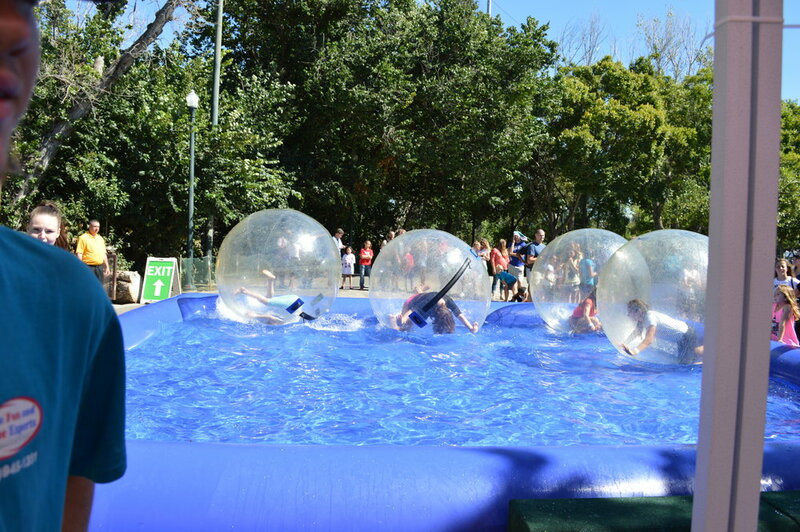 Think of a giant hamster ball in a huge pool of water. 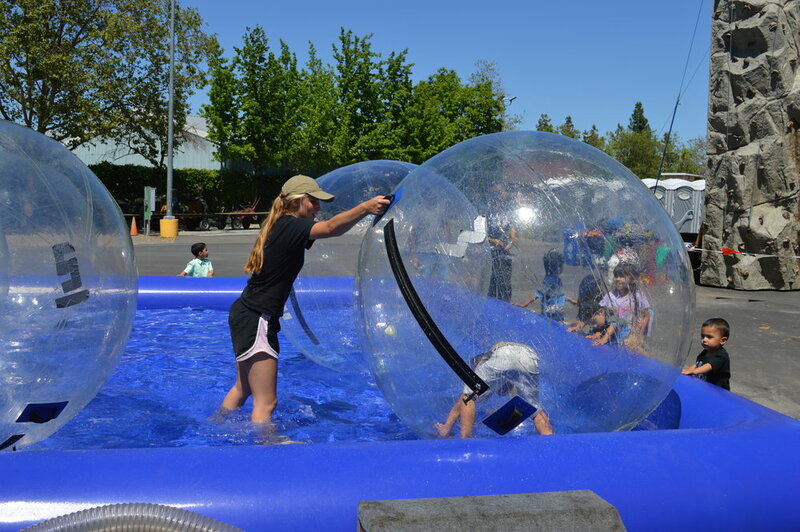 This inflatable can hold up to 6 players, each in their very own giant ball full of air. This inflatable requires water access and includes two trained staff. Water can be hauled in by truck for an additional charge. Wrecking Ball is the best game to challenge your friends in a duel! 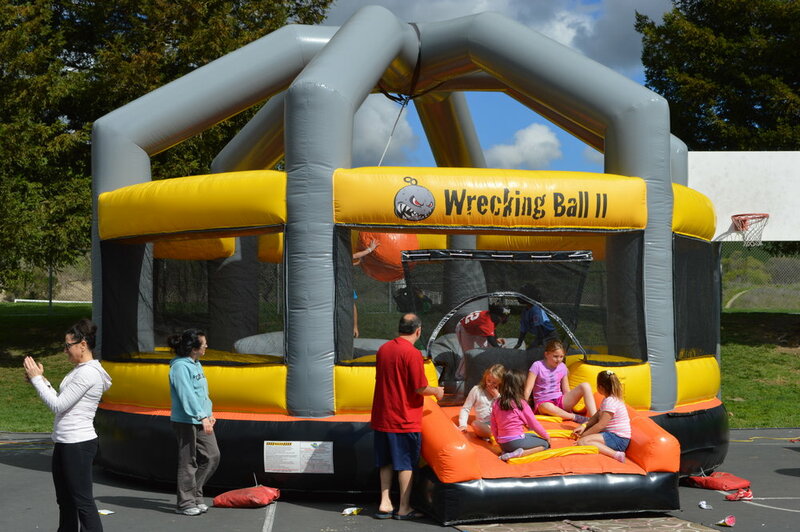 The players get onto a inflated pedestal and use the giant Wrecking Ball to knock each other off onto the inflate!